What is the diameter of these glasses? Thank you. BEST ANSWER: These glasses have a 3 inch diameter. My guess is no more than 2 inches. But I gifted them so cannot measure exactly. After a lot of research I found them to be the perfect size and had them engraved as well. If you're considering purchasing I highly recommend. Is the bubble in the glasses sealed, or can water get inside it during washing? BEST ANSWER: Not sealed. Water can get inside, but quite frankly, I have never had a problem when drying this. The bubble in the glass is sealed. No water can get inside it. These glasses are great and beautiful! We are very happy with them. The bubble in the glass is sealed. My husband (the Scotch drinker) loves them! It is sealed. I wash them in the dishwasher all the time with no problem. The bubble in the glass is sealed. No water can get inside it. Not true actually. I went ahead and bought this set. Inside the glass is sealed, but if you turn the glass over there is a hole in the bottom leading to the bubble. so during washing water/soap can get in there. have to be careful. Hi, please feel free to reach our customer care team and they can assist with this. BEST ANSWER: I don't think it's crystal if you mean something like Waterford. It is a nice glass. It is not crystal, but it is a beautiful, solid, hand-blown whiskey glass. 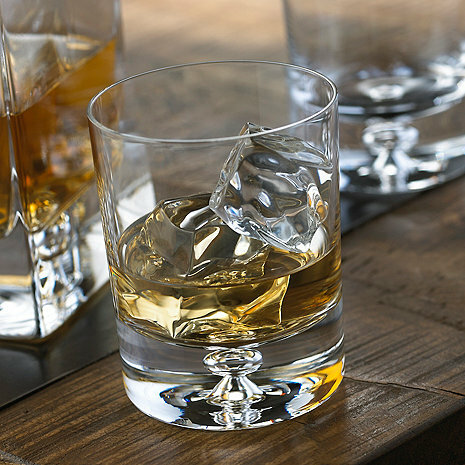 The Lexington Whiskey Glasses (set of 2) are lead free crystal. Can you please tell me where these glasses are made? BEST ANSWER: It does not say. I will say though that regardless of where it is made, it is excellent quality. How tall is the glass? How heavy is the glass? How thick is the base of the glass? These glasses are solid, classy, have a clean, simple yet elegant design. I truly enjoy my whiskey in these glasses. I highly recommend them. I bought the first set for my husband and he loved them so much I ordered a second set. They are beautiful and we love them. Nice and weighty in my hand. I am not afraid of breaking this pair. The encapsulated bubble was a surprise. I was a thinking I paid to much, but after using, I am very pleased. I bought a set of four for my husband for Christmas and he loves them. They are heavy in weight, feel substantial, the little bubble design in the bottom adds a bit of dramatic flair. Great price for the quality. Mynhusband wanted a heavy bottom scotch, rum glass and he loved these. Very well made. Had to purchase a few more glasses for a wedding gift, and these were the add on's, the couple loved the gift. It's very classy looking and I would purchase it again. I bought them as a birthday gift for my best friend (since high school), who is not only a GREAT person, but is also a "bon vivant" and a lover of life as well as of all things pleasurable, beautiful, and fine, including wine, beer and spirits. While Christmas gifts tend to be for our families, our birthdays always bring out the BEST gifts for incredible personal enjoyment. This year was a set of your Lexington Whiskey glasses and he called me the moment he opened the gift to let me know how "blown away" he was by their gorgeous appearance and their feel. He decided to give them an immediate "test drive" so he immediately dropped a small ice cube into the glass while his wife opened a bottle of Lagavulin that she had purchased for the occasion and poured it so I could hear the first ice cube - and the first drink being poured into his new glasses! They use them EVERY night. Thanks for an incredibly sensuous product that enhances the JOY of giving for everyone involved. These glasses are the perfect size for whiskey on the rocks or whiskey with a splash of seltzer. Nice weight and classy looking! Unfortunately, while the product description says "dishwasher safe" one of our glasses broke in the dishwasher. The weight of the bottom put too much pressure on the upper portion of the glass while angled upside down and cracked the glass.